By the time THE PLAYERS Championship 1987 rolled around, fans had five seasons to explore the wonders of THE PLAYERS Stadium Course at TPC Sawgrass. Clearly, those treacherous holes at 16, 17 and 18 that wrapped around ominous bodies of water had been declared prime spots to watch history get made. Everything from eagles to double-bogeys would produce emotions ranging from exhilaration to heartache. So, when on the sixth visit to Pete Dye’s Stadium Course the fans got an extra session of action at 16-17-18 — a sudden death playoff between Sandy Lyle and Jeff Sluman that went three holes — it was special. But even for holes that promised the unexpected, there was a surprise. At the island-green 17th, the second playoff hole, Sluman stood over a 6-foot birdie try when suddenly a fan jumped into the water. Sluman backed off, re-grouped, settled back in . . . and missed. Lyle felt awful, suggesting Sluman was going to make the putt. Sluman said, “we’ll never know,” but didn’t deny that it disrupted him. The first playoff at the Stadium Course and the first $1 million purse at THE PLAYERS ended at the next hole with mixed results on putts for par —Sluman missed his 12-footer, Lyle made his 8-footer. “I have a fairly low heartbeat in those situations,” Lyle said. They had shot 70 (Lyle) and 69 (Sluman) to finish at 14-under 274 thanks to birdie putts at the 72nd hole and quickly fans hustled back to that special area to watch the action at 16 and 17, knowing you could expect the unexpected. 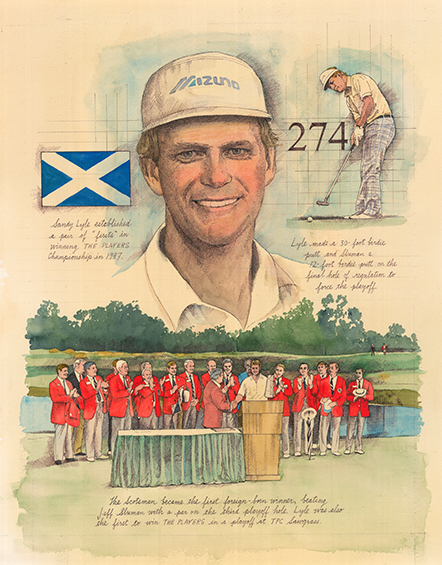 In 1987, Scottish golfer Sandy Lyle became the first winner of THE PLAYERS Championship from outside of the United States, but he was made to work for it after three-hole playoff with Jeff Sluman. After both finishing on 14-under-par 274 following respective 69 and 70 final rounds, the pair went to the 16th for a sudden-death playoff, which they both parred.